"…Everything just falls into place... There's tonnes of headroom, and I never have to push it hard at all to get exactly what I want out of it." USA – Psychedelic rockers, Portugal. The Man, have been on a charge. Fresh from collecting a Grammy for Best Pop Duo/Group Performance with the song Feel it Still, they're currently on a world tour promoting the band's eighth studio album, Woodstock. Front of House Engineer Charlie Izzo has chosen the SSL L300 live console as the ideal tool for this dynamic, multifaceted show. On this tour Izzo deals with anything from 40 to 60 inputs per show, depending on factors that include a steady stream of guests, choirs, and/or orchestras - variable according to the city they happen to be playing in. This, the wide range of material and styles that the band visits, and the fact the band refuses to use any tracks, makes for a challenging, and very 'live' show. "The set opens with a Metallica cover," says Izzo. "And they might do anything from an Oasis tune, some Beatles, some psychedelic rock, and some really heavy stuff. Dynamic control is a big factor... And it's a very loud show on stage as well; half the band is on ears, the other half is on large side fills - and of course the Fender twins are pretty well opened up." Izzo has found that a stem-based workflow works well for him, as he was already using a basic group-based mixing approach with his previous console. The Stem is a more flexible type of path that can have full processing, including inserts, and can be picked off from six different points in the source path. "Everything goes through at least one stem before it hits the master bus, and often more... I have some stems, like my delays and reverbs that go into a full effects stem for broadcast recording. Even if people are taking a multitrack from me, I can at least send them my effects stem, so they get that the way it's supposed to be." Izzo keeps the main stem group faders handy for most of the show, on the SSL's left-hand fader tile, while the right-hand fader tile is normally dedicated just to John Baldwin Gourley's lead vocal - a particular feature of the Portugal. The Man sound. "I have about 16 channels of vocal effects for John," explains Izzo. "There a lot of wired, trippy things going on there - choruses, delays, slap backs, distortions, overdrives, and harmonies. John is quite particular about how he wants them to sound and when he wants them, so they are all available, right in front of me, for any time during the set." For example, the lead vocal on Live in the Moment - the current single - includes two harmony channels (octave, up, octave down), distortion, and a tap delay, mixed with the dry vocal. An auto-tune effect comes in for the chorus, where the dry vocal drops out completely. Izzo uses the Reverbs delays, chorus' and distortion effects from the console's internal FX rack, while a couple of additional outboard units bring some specific studio-created sounds to the mix. 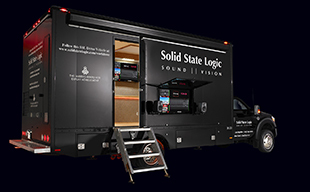 Izzo agrees with much of the public commentary around the SSL Live Consoles and their sonic qualities: "The overall tonality is great and the summing is wonderful – it sounds very natural. When I first started using console I put a mix together really quickly - everything just falls into place... There's tonnes of headroom, and I never have to push it hard at all to get exactly what I want out of it."